I thought it would be useful to actually put some pictures into this blog (which, like my law school books, is very text heavy). 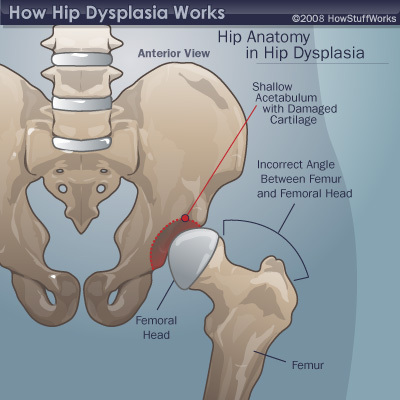 So here is a drawing of how hip dysplasia works. For me, this is probably how my right hip looks where the acetabulum is too shallow and not enough of the femoral head is covered. My left hip has retroversion — the acetabulum covers enough of the femur but it is tipped forward. On my right hip, they are going to tip the acetabulum further outward whereas on the left, they will tip the acetabulum toward the back, I think. I have to be honest, I can’t quite figure it out myself (that’s probably not such a big deal as long as I’m not doing the surgery). This is a great link to how the PAO surgery is going to go: PAO Animation. I found it very useful. This entry was posted in Uncategorized on November 9, 2012 by dramaticallyhip.